Oval chainrings compatible with the new ALDHU cranks, ROTOR's lightest crankset ever, but also compatible with 4-bolt Shimano® cranks. When mounted to ROTOR's ALDHU cranks, these Q RINGS can be adjusted in 1-degree increments. 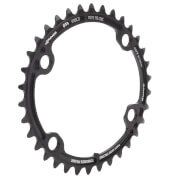 When mounted to Shimano® cranks, the chainrings are set to intermediate position OCP3, which is the position most frequently used by road riders. For a perfect aesthetic integration with Shimano® cranks, there is a set of bolt covers for the different crank models.